1: The Lead leaps back 90° clockwise around the Follow with his left foot while she leaps with her right foot forward between his feet, as in the Leap Waltz. "&"*: The Lead steps side right along LOD, as the Follow steps side left along LOD. * Note on Timing: The "&" used to describe this timing is different from the "and" used to describe Polka time. It's like a dotted ("swung") triple, as in Lindy Hop, except that in this case it's a dotted quintuple (1 &2 &3). 2: The Lead closes left to right with weight, as the Follow closes right to left with weight. "&": Repeat first count "&." 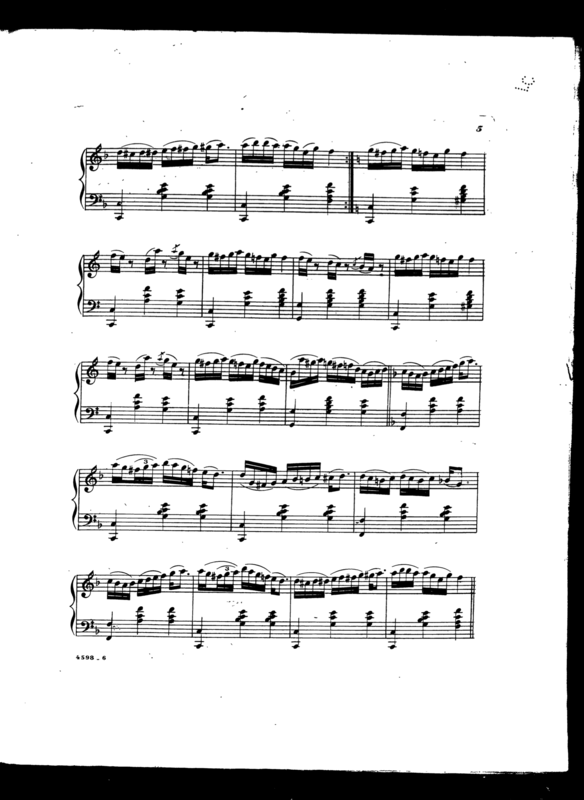 4 &5 &6: The Lead does exactly what the Follow did, and vice-versa. * Note on Style: All of the steps feel like little leaps, light and airy, up on the balls of the feet. When it works, it almost feels like flying, as if your feet are never touching the floor. All together, it goes: "back, side-close, side-close / front, side-close, side-close," turning 360° in six counts. DeGarmo 1892 notes that the Newport can be reversed. Lopp 1903 describes a dance called "Le Western Normal Newport," which alternates right and left turns: three bars turning to the right, then a Follow-backing waltz transition to three bars of turning to the left, and a Follow-backing waltz transition to repeat. Cartier 1882, Koncen 1883, and Harvey 1889 describe other steps called "The Newport," but they appear to be unrelated to The Newport described above, and none is clear enough to definitively reconstruct. 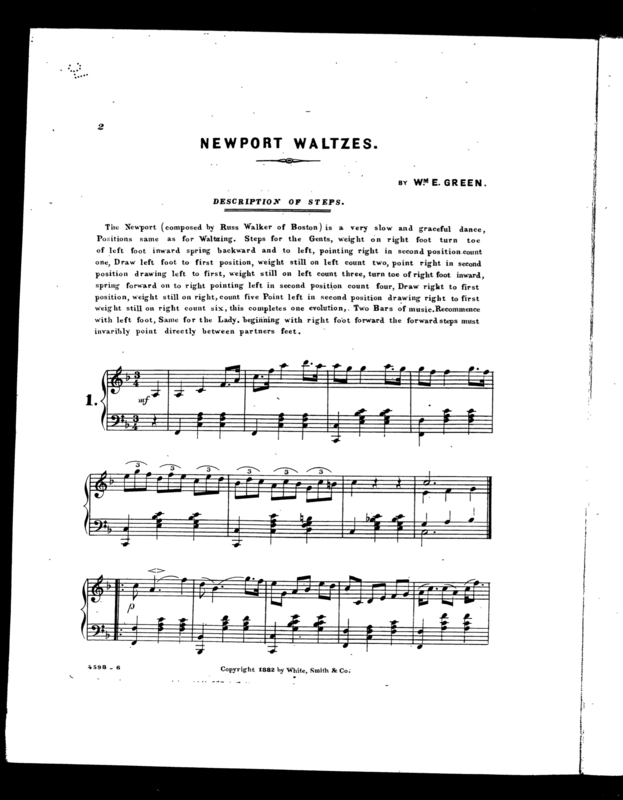 Music in waltz time, particularly songs with the characteristic 1 &2 &3 rhythm of the Newport. 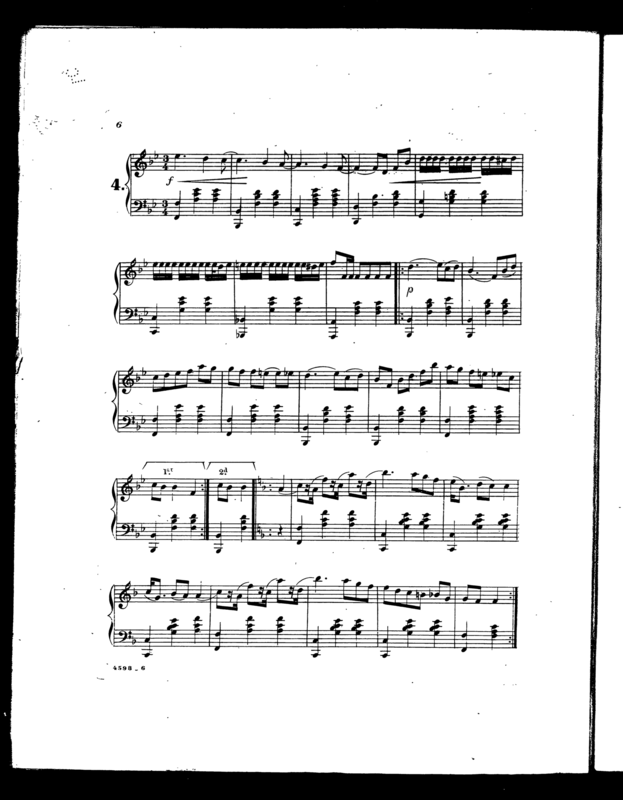 Kopp 1896 suggests a tempo of 45 measures per minute, or 135 beats per minute. Lopp 1903 suggests 144 bpm. 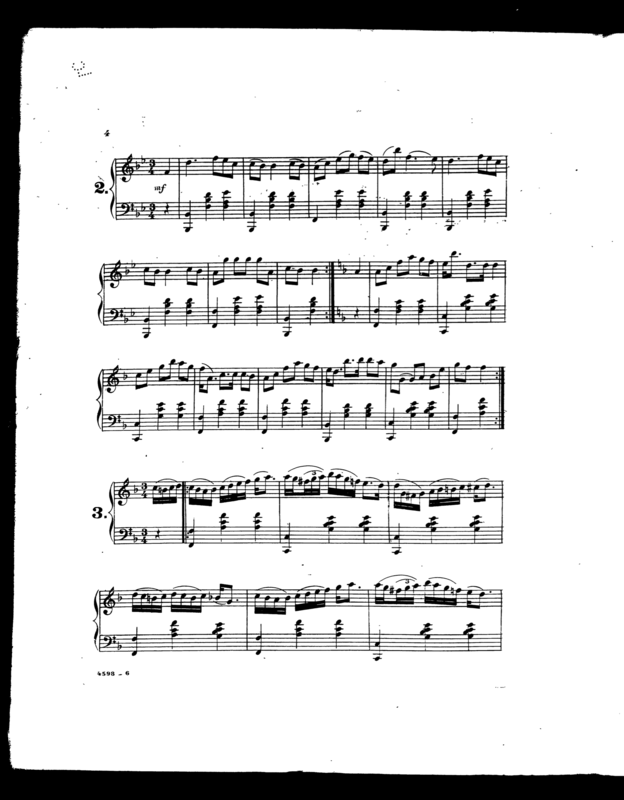 Greene 1882 provides the following music, and suggests that the dance is "very slow and graceful." 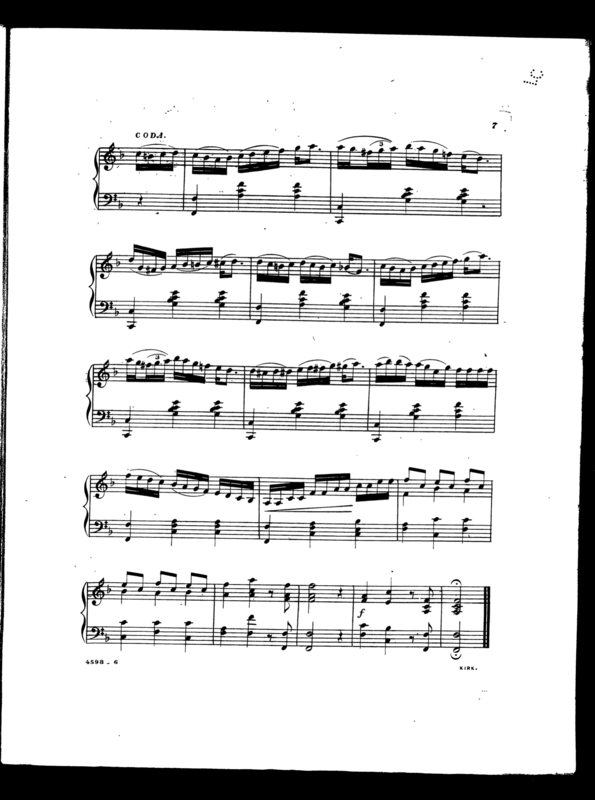 William DeGarmo 1892 recommends Polka Mazurka music. Greene 1882 and Gilbert 1890 both cite Russ B. Walker of Boston as the originator of the Newport. The name is likely a reference to the town of Newport, Rhode Island, a popular vacation spot for the wealthy in the late 19th century. The variations below aren't actually described in the historical sources, but they're also fun, and well within the realm of 19th century possibilities. Three-Quarters Newport: An adaptation of Lopp's "Western Normal Newport." Do the Newport for counts 1 through 9 (three half turns), then simply waltz for counts 10-11-12. It adds a nice bit of variation to the sensation. Or mix Waltz and Newport at will. The Waltz Galop is a Newport adapted to two counts ("back, side-close, repeat opposite"). The Ripple Galop is a Newport adapted to four counts ("back, side-close, side-close, side-close, repeat opposite"). The Bronco Schottische incorporates both the Newport and Waltz Galop. The Newport (composed by Russ Walker of Boston) is a very slow and graceful dance, Positions same as for Waltzing. Steps for the Gents, weight on right foot turn toe of left foot inward spring backward and to the left, pointing right in second position count one, Draw left foot to first position, weight still on left count two, point right in second position drawing left to first, weight still on left count three, turn toe of right foot inward, spring forward on to right pointing left in second position count four, Draw right to first position, weight still on right, count five Point left in second position drawing right to first weight still on right count six, this completes one evolution, Two bars of music. Recommence with left foot, Same for the Lady, beginning with right foot forward the forward steps must invariably point directly between partners feet. Take three long galop slides with the left foot on accent, and as right is brought up to left foot for third time, rest, and hold left foot slightly raised from the floor. To make the second step, rest the left foot and raise the right foot slightly from floor. To make the third step, rest right foot and raise left foot slightly from floor. To make fourth step, rest left foot and raise right foot slightly from floor. To make fifth step, rest right foot and raise left foot slightly from floor. Repeat by sliding with right foot, etc. In commencing rest the whole weight of the body on the right foot, the toe of the left pointing to the floor. Re-commencing above and so on alternately. Stand in first position, with weight on right foot. Leap backward from the right to the left foot (4th), 1; pass right to the side (2d), and almost simultaneously draw left to right (1st), placing weight on left, & 2: pass right foot to side, and draw left to right (1st), & 3: one measure. Leap forward from the left to the right foot (4th). 1; pass left to the side (2d), and almost simultaneously draw right to left (1st), placing weight on right, & 2; pass left to side and draw right to left (1st), & 3; one measure. The turn is made principally, on the first: and second movements: the third movement should be made directly sidewise. In reversing, the backward leap must be made from the left to the right foot, and the forward leap from the right to the left foot. By permission of Russ B. Walker. For description, see the Newport. Slide back with left to fourth position (count 1). Draw right to second position, at the same time draw left to right, third position, changing the weight to left foot (count 2). Repeat (count 3). (This step is the same as the Newport). Tempo 3/4. Métronome (noire) 144. Ramener le pied droit vers le pied gauche et immédiatement porter le pied droit à la 3e position, en la tenant très légèrement levé . . . Compter 3, 1 mesure. Ramener le pied droit vers le pied gauche et assitôt porter le pied droit à la 3e position en le tenant très légèrement levé . . . Compter 3, 1 mesure. 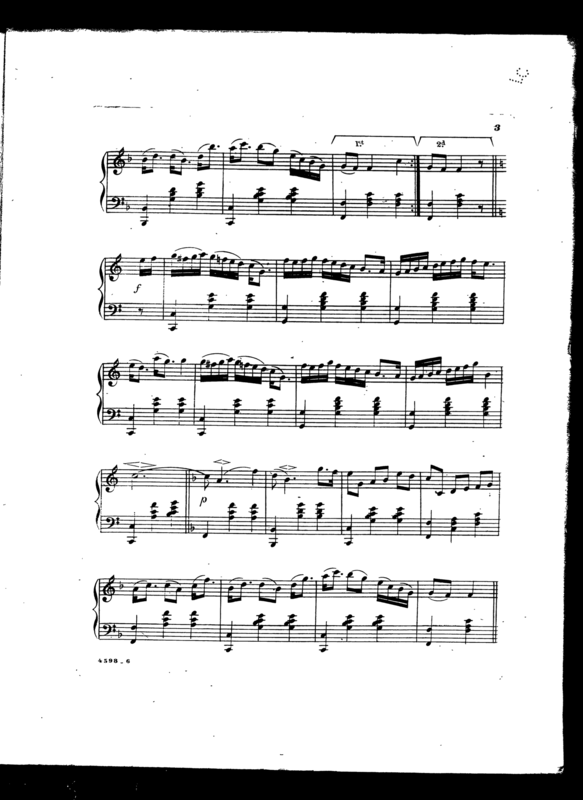 Reprendre le tout; la contre-partie pour la danseuse. Remaeque. — On doit faire tourner principalement sur le 2e pas, sur les autres on fait simplement 1/4 de tour. Par l'Association de ;'École normale des Maîtres de danse de l'Ouest. Faire trois mesures de Newport . . . 3 mesures. Ensuite le cavalier fait trois pas en avant et la danseuse — vu la position — trois pas en arrière, ce qui doit prendre une mesure . . . 1 mesure. De nouveau faire troise mesures de Newport, mais les faire à gauche . . . 3 mesures. Ceci fait, comme précédement le cavalier fait trois pas en avant et la danseuse trois en arriè, et cela durant une mesure . . . 1 mesure.